Investigate potential causes of the Warrior-Poet's loss of divine power. Lord Vivec fears that the mysterious affliction that drains his divine energy may be the result of an enemy's attack. He asked me to work with Archcanon Tarvus to determine the source of the attack by conducting investigations throughout Vvardenfell. Talk to Vivec at his Palace in Vivec City. Investigate the clockwork mage at Barilzar's Tower. Investigate cultist activity around Balmora. Investigate the Ashlanders near Ald'ruhn. This quest starts immediately after the end of Divine Conundrum, as a continuation of the conversation you were having with Vivec. 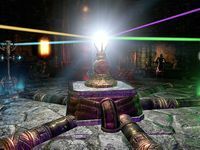 You can continue to discuss Vivec's affliction, and even ask him what the rest of the Tribunal thinks about it, but to proceed with the quest, leave the Palace and return to the Archcanon's Office. Archcanon Tarvus will again be consulting the books behind his desk. "I performed that ritual countless times and it never exploded in my face before! If I discover that you sabotaged the divination …. No, I shouldn't take my failure out on you. It's not your fault that things are … difficult." By difficult, you mean Lord Vivec's loss of power? "How do you know about—Lord Vivec told you? Of course he did. It's his prerogative, I suppose. You must swear to keep this a secret, though. There would be panic in the streets if the people believed one of the Tribunal was incapacitated." Lord Vivec said you might need help investigating the source of the problem. "It's true. I'm much better at scholarly pursuits than field work. And the ritual wasn't a total failure. It confirmed three locations from my earlier studies—Balmora, Ald'ruhn, and Barilzar's Tower. I need you to investigate each of these sites." Tell me about these locations before I head out. "I researched what I could using the resources available here in Vivec City. To learn more, I need an agent to personal assess each location. Lord Vivec thinks you're the best one for that job. Can you tell me anything about Barilzar's tower? "I believe the mage seen in the ritual is Barilzar, who works out of an ancient Velothi tower. His experiments radiate energy similar to Vivec's affliction, but they're not a perfect match. Find out what he knows about the transfer of divine energy." 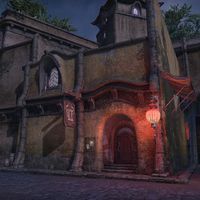 What can you tell me about Balmora? "House Redoran controls the town and nearby mines. House Hlaalu also has interests in the region. Rumors of a cult in the area concern me the most. I believe we saw a cultist during the ritual. Make discreet inquiries and see what you can learn." What kind of a cult are we talking about? "I have no idea. That's why we're sending you. I suggest you start at the inn. Secrets get spilled along with the drinks in such places. The miners may know something as well. And I've heard that House Redoran has issued some kind of proclamation." What do you know about Ald'ruhn? "Savage Ashlanders, like the one seen in the vision, use the area as a tribal meeting ground. These nomadic heretics deny the divinity of the Tribunal and have no love for Vivec, but how they could be involved eludes me. See what you can uncover." I'll investigate Balmora, Ald'ruhn, and Barilzar's tower. "I traced tendrils of Vivec's energy to these locations and the ritual confirmed the connection before it went awry. Just don't discuss Lord Vivec's condition with anyone. We don't want to start a panic. If anything changes, I'll contact you." Barilzar's Tower is located in the Azura's Coast region of Vvardenfell, slightly northeast of the daedric ruin Almurbalarammi, and due west of the Shrine of Azura. The easiest way to get there is to go to the Molag Mar wayshrine and head east. Once you've found the front door to the tower (the back door is not accessible until a later quest), you'll enter in to a small hallway. This will lead you into Barilzar's Laboratory. Barilzar is in the middle of an experiment involving a complicated clockwork machine and different colors gems, and is not happy to be interrupted. "Such displeasure and disappointment! Nothing works even though every calculation is precise. And now an interruption. How infuriating! Wait, wait. Sometimes the Great Gear turns from frustration to opportunity …." Do you know anything about divine energy? "Divine energy? I'll have you know I participated in Lord Sotha Sil's Nine Analyses of the Exalted Enigmas. But we have more important matters. I'm about to determine the correlation between color and time, and I could use another set of hands." If I help will you answer my questions? "A reciprocal exchange? Interesting. Yes, I can see the benefits of such an arrangement. Very well. Just activate the crystals in the proper sequence while I modulate the energy flow. Less chance of an explosion that way." All right. I'll see if I can determine the proper sequence. 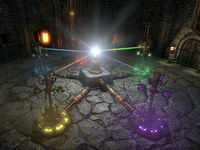 There are five pylons to activate on Barilzar's machine, each one with a different color: Red Sphere, Yellow Tetrahedron, Green Square, Blue Diamond, and Violet Octagon. You have to activate them in the right order; if you pick the next correct one in the sequence, a note will sound and a light will shine from that pylon to the center prism. If you pick the wrong one, a buzzer will sound, any pylons you have lighted already will go dark, and you will have to start again. There are no hints in the room for this puzzle; the solution is to activate them in rainbow order (i.e., the order they are listed in at the start of this paragraph). Once you have activated all five, talk to Barilzar again. "Perfect! Such are the benefits of an extra set of appendages! The energy flows freely and without disruption, allowing the rods and pistons to align in a most pleasing manner. Thank you. Now, why do you want to know about divine energy?" Well, I was sent to ask you about the transfer of divine energy. 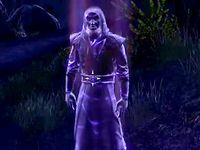 I was just thinking about my former master, Sotha Sil, and the experiments we conducted. He desperately sought to understand the power he and his companions attained—especially whether or not that power was temporary." Did Sotha Sil reach a conclusion? "Not while I assisted him. He had a tool that he used to drain away minute bits of energy to store and study. He could extract it and return it as he saw fit. Not sure what became of the tool, but here are my notes from those days. Barilzar gives you Barilzar's Notes and that completes your investigation of his tower. Balmora is a city in the West Gash region of Vvardenfell. It is northwest of Vivec City, and can easily be reached by Silt Strider. Once you have entered the city, your quest marker will change from the city itself to three specific leads to investigate. One is a proclamation from House Redoran, saying that Shulk Ore Mine has been closed, and all workers and visitors are to avoid it. Another lead is a Khajiiti miner, attempting to board a boat on the river that runs through the city. As you approach the boat, you can hear the miner (Renaku) talking to the boat's captain, Glendora Saccus. Renaku: "Please, this one needs to get out of here! Those cultists, they're insane!" Glendora: "All right, but keep your voice down. I'll be ready to leave soon enough. In the meantime, if anyone asks, you're just here to haul cargo." When Glendora moves to the other end of the boat, you can talk to Renaku. "What? Who? This one is just here to haul cargo!" Relax, I'm here to help. What was that you said about cultists? "Cultists? This one said nothing about cultists! Perhaps you're thinking of another Khajiit …. Look, Renaku just wants to leave all these crazy Dark Elves behind and find a safer mine to work in. The Shulk Ore Mine is cursed!" If you tell me about the cultists, I might be able to do something about it. "Really? You? Just leave Renaku out of it! If you want to know what happened so badly, just go out to the Shulk Ore Mine and see for yourself!" [Intimidate] Tell me about the cultists or I start yelling for the House guards. "No one likes a guar licker, you clawless kitten! It happened a few days back. Weird cultists just barged in and took over the mine. This one managed to get away, but the Crew Chief and some of the others are still out there. Happy now, fish breath?" "Secrets get spilled along with the drinks in such places." The third lead is a barmaid in The Randy Netch Inn, a Dark Elf by the name of Milesa Relavel. "I love seeing new faces! For a while, it was just the same old miners and the occasional traveling merchant. Thought Carellon might have to shut this place down. Look at me, talking your ears off! What can I get you?" Any idea why visitors have been scarce? No, I'd rather not talk about that with a stranger." "I'm sure you do, but I have to live here, you know? Look, there's nothing I can tell you. If the Houses ever found out I told an Outlander about our troubles …. Maybe one of the miners would be more willing to talk to you." "I like the color of your gold, Outlander! Just between us, I heard the House Guard shut down the Shulk Ore Mine. Something to do with violent cultists who attacked the miners and took over the place. Even got the Crew Chief, or so I heard!" All three of your leads mention the same place: Shulk Ore Mine. Head back out of Balmora through the southern gates, then west to get to the mine. Just outside the mine's entrance, crouched by a tree, is Crew Chief Hondulf. "You shouldn't be here! Didn't you read the House Redoran proclamation? I wouldn't be here myself, but some of my miners are still in there!" Can you tell me what happened in the mine? "Our mine was invaded by violent cultists! They showed up and just took the place over. My people are trapped. I'm no expert, but it looked like the cultists were preparing to conduct a ritual before the Ashlander interrupted them." Why do you think the cultists are conducting a ritual? "Probably because I heard one of them say, "With this ritual, we'll call forth a mystical weapon and attain the power of a god!" Or something along those lines. Look, I was just trying to get me and my miners out of there when the Ashlander showed up." An Ashlander interrupted the cultists? "Well, I never actually saw an Ashlander, but I heard a cultist yell, "Ashlander thief! That's our mystical weapon!" That's not an exact quote, but you get the idea. I don't know what happened after that. I was kind of busy trying not to die." What kind of a mine is Shulk? "It used to be an ore mine and we hope it will be again. My crew was inside, preparing to start up mining operations, when the cultists attacked. The way things are going, we might just have to turn the place into another kwama egg mine." I'll go into the mine and see what I can find out. "Really? That's awfully brave of you. If you see any of my miners, tell them to get their arses out here. I'll wait as long as I can. Or until I hear screaming. Then I'll go to Balmora and try to find some help. Enter the mine, and follow the path inside. You may encounter some Nycotic cultists that you will need to fight. One of the items you're looking for is a scroll (that has been dropped on the ground) called Red Exile Instructions, which is a letter from "CC" to the Red Exiles, instructing them to steal the staff from the Nycotic cultists and bring it to him. Once you have found the scroll, continue heading straight (east) further into the cave. You will come to a door that leads to the Deep Mine Chambers. Go through it and you will find yourself in a large chamber, where multiple Nycotic cultists are gathered to conduct a ritual. You can sneak around them to retrieve the indicated bag of ritual items, or try fighting them. If you decide to fight, most of the cultists will be mysteriously burned in blue flames, leaving only Curate Erydno. Either way, the Nycotic Ritual Bag will be on a small outcropping behind and above the cultists. Retrieve it and exit the mine again. Once outside, talk to the crew chief again. "Did you find what you were looking for in the mine?" I'm not sure. I need to consult with my contact. "Of course. I perfectly understand. I think I'll wait a little longer and see if any of my miners were able to escape from the cultists. Good luck with your mission, whatever it is." And with that, your investigation of Balmora is completed. Ald'ruhn is an Ashlander settlement not far north of Balmora. You will find your contact for this part of the investigation on the road slightly south of the Ald'ruhn wayshrine. As you approach her, she is confronting some Red Exiles. Seryn: "I demand to see my brother. Lay hands upon me, and you will lose them!" She then knocks the Red Exiles down and calls out to you. Seryn: "You there! The territory of the Red Exiles shouldn't be traveled lightly." Go over to her and talk to her. "Ashlanders once respected each other, helped one another. You'd think these were House wolves or Tribunal dogs, the way they treated me. Speaking of the Tribunal, you have the smell of dog about you. I wonder why that is?" I'm looking into something for Lord Vivec. ""Lord" Vivec, is it? And I thought all the Tribunal cared about was building monuments to their own greatness. Nice to see that one of them cares about what's going on beyond their borders. Well, perhaps we can aid each other this day, Outlander." "Ashlanders are nomads, but we gather at sacred sites to trade, confer, and pay homage to the past. Ald'ruhn is such a place. That's why Chodala invited the Red Exiles here. But these outcasts won't let me into their camp. I need to find my brother." "My brother, Chodala, is the Ashkhan of our tribe and I am his ambassador. I act as a go-between among the tribes. Chodala wants to unite the Dunmer and calmly end the era of the bickering Houses. He hopes to convince the tribes to follow his lead." "Head into the Red Exiles camp and find my brother. Otherwise, see if you can find out what he was doing in there and where he's gone. Be wary of the outcasts. As you saw, they won't hesitate to attack without reason or provocation." If you ask, Seryn will tell you more about her brother, the Red Exiles, and her tribe (the Urshilaku). Go up the hill from her to find the Red Exiles camp. You will find multiple hostile Red Exiles, but no Chodala. In one of the tents, there is a scroll titled Meeting with Chodala. Take that and return to Seryn. "You seem to have survived your visit to the Red Exiles camp. Did you find my brother?" No, but I found this record of his meeting with the Red Exiles leader. "Interesting. I never suspected that the outcasts were disciplined enough to keep records such as this. Oh no. I can't believe my brother would be so … brazen." He calls himself the Nerevarine. Do you know what that means? "It means that Chodala really has changed. With his newfound powers and rising ambitions, I fear what he plans for the tribes. I suppose you have a right to know what I'm talking about. Take this. I found it among my brother's possessions." Another scroll? Did Chodala write this? "Chodala discovered a new power out in the wilderness and it changed his view of the world. He writes about it in that document. Now he believes that he's the Nerevarine and incites the tribes while I try to keep them all from doing anything rash." She will give you Chodala's Writings, and you can ask her for more information about Chodala's new power. Your investigation in Ald'ruhn is completed. Once you have Barilzar's Notes, Chodala's Writings, the Nycotic Ritual Bag, and the Red Exile Instructions, a projection of the Archcanon will appear near you. Archcanon Tarvus: "Outlander! Over here!" (after you get closer to the projection) "This requires a considerable amount of effort, so just listen. We have a…problem here. Return to my office immediately." He will then disappear. Do as he says and return to Vivec City, and to the Archcanon's Office. Archcanon Tarvus will be in his usual spot. "At last! Did you see what's happening outside? Red Mountain rumbles louder and more frequently, the sky grows dark, and, worst of all, the people are beginning to notice! Soon, I'll have to muster the Ordinators to keep them from the palace doors." Is that the emergency? The people want to see Lord Vivec? "In part. Lord Vivec is … not well. I won't allow his followers to see him in this state. He continues to lose energy and it's becoming difficult for him to maintain the realm in his usual fashion. Now, what did your investigations uncover?" I investigated the three locations. Here's what I learned. "I'll review these documents and present your findings to Lord Vivec. I was against bringing you into this investigation, but I was wrong. Thank you for aiding us. You should go see Lord Vivec now. He's been asking about you. I'll be along shortly." You're going to just read the notes? I thought we could discuss what I learned. "Very well. Tell me what you learned at each of the locations and let's see what conclusions we can come to." Barilzar told me about Sotha Sil's experiments with divine energy. He gave me his notes. "Barilzar faithfully served Sotha Sil. He's as loyal to the Tribunal as I am. He would never intentionally harm Lord Vivec. But that tool he mentioned. Perhaps one of the priests Vivec sent away could search the Temple archives for more information." Vivec sent away all his priests? "Lord Vivec doesn't want his followers to see him in such a weakened state. Only you, Canon Llevule, and myself are permitted into his palace now." An Ashlander named Chodala has been inciting the tribes. "So your notes say. And this Seryn assisted you. Interesting. Most Ashlanders want nothing to do with the Tribunal. Even so, they rarely become aggressive. I'd say this Chodala bears watching. If we can spare it, I'll send an Armiger to Ald'ruhn." Chodala's newfound power might have something to do with Vivec's problem. "Interesting theory. Perhaps Chodala's staff can steal Vivec's energy, but I have a hard time imagining how an Ashlander could accomplish such a feat. Lord Vivec said the draining has grown more intense since you left. He doesn't look well." Cultists took over the mine outside Balmora. "From what you discovered, I dare say there may be a correlation between the Nycotic relic and the tool Barilzar mentioned. And it seems the Ashlander thieves are connected to Chodala. Your evidence points to a clear conclusion." Chodala is using Sunna'rah to steal Vivec's energy? Lord Vivec's doing his best not to complain, but I can see how much the draining of his energy has cost him. Just seeing you again should improve his mood considerably. And the progress you made with your investigations, outstanding!" Leave the Archcanon's Office and head up to the Palace. You will find Vivec in an weakened state, and Canon Llevule asking to send for aid. Vivec would prefer to keep his weakness private, and wants to know your news. This ends the quest. The Archcanon has indeed entered the Palace, and talking to him now will start Divine Delusions. I should talk to Archcanon Tarvus in his office and find out what he needs me to investigate. Archcanon Tarvus asked me to investigate three sites to search for clues concerning the source of whatever is draining Vivec's divine energy. These sites include Barilzar's tower, Balmora, and Ald'ruhn. I investigated the locations Archcanon Tarvus suggested and I collected the cult's ritual bag, the Red Exiles instructions, Chodala's writings, and Barilzar's notes. The Archcanon sent me a message. He needs me back at Vivec's Palace. I returned to Vivec City. Now I should talk to Archcanon Tarvus, let him know what I found at Balmora, Ald'ruhn, and Barilzar's tower, and find out what emergency transpired that he saw fit to send me a message. Finishes quest While Archcanon Tarvus reviews what I uncovered during my investigations, I should report to Lord Vivec and let him know I returned. This page was last modified on 28 October 2018, at 11:19.